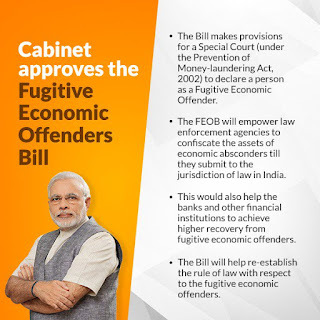 The main aim of the bill is to stop economic offenders who leave India to avoid due process. The proposed bill will be applicable to all offences which involve amounts of Rs.100 crore or more. The bill also provides for confiscation of benami properties. As per the bill confiscation will not be limited to properties that are proceeds or profits of the crime. The proposed Bill also has provisions for setting up of a "Special Court" under the Prevention of Money Laundering Act. The court will declare an individual as "fugitive economic offender". How the new law is different from Prevention of Money Laundering Act? 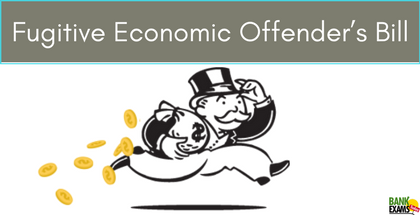 Previously Prevention of Money Laundering Act provides for confiscation of assets of economic offenders. 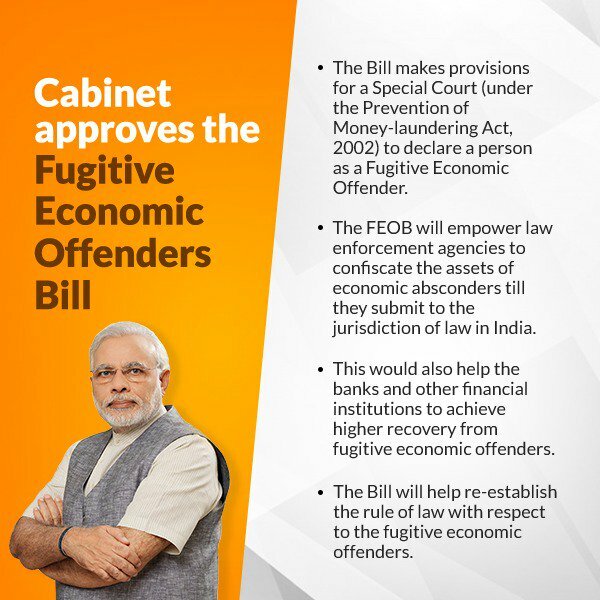 The proposed provisions of the economic offender's bill are different from Prevention of Money Laundering Act. In PMLA only profit of crime is confiscated and that too after conviction. The new law extends to all properties irrespective of whether it is acquired as a result of crime.